Let me just start off by saying that I have never, ever, worked on weekends. 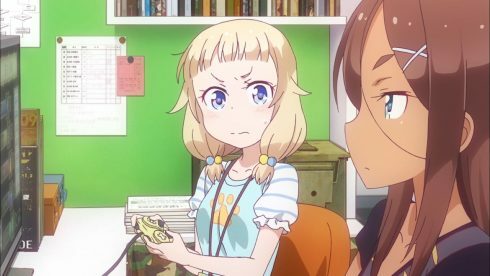 While at least one place I’ve worked for has given me the option to do so, I preferred to work overtime during the week instead. My weekends must always remain inviolate. That is the time when I rest and attempt to recover from the toll the other five days of the week have taken on my sanity. 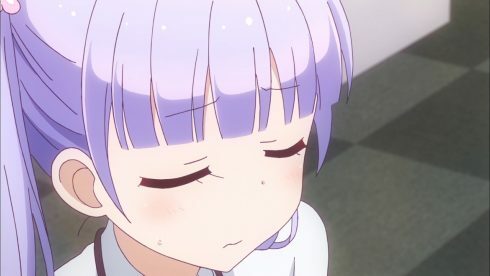 Thus, while I’ve never personally been in Aoba’s position, I can understand her feelings. Working on those days when you’re supposed to be resting would be exhausting and psychologically draining. The body and mind need breaks from continuous work in order to keep functioning properly. To this situation, apply donuts! 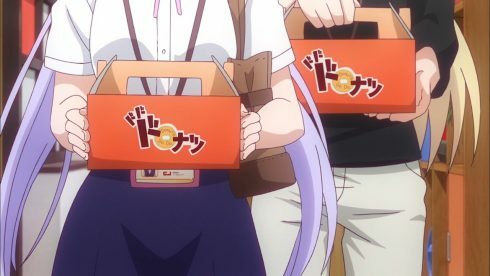 Donuts are the standard morale-booster around offices, probably because it’s hard to find someone who unilaterally dislikes them. 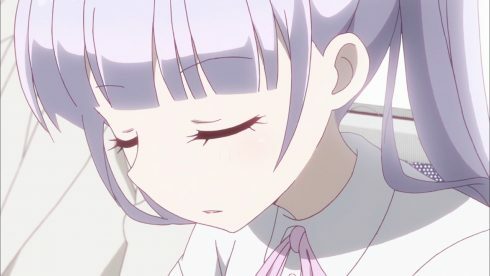 Also they help hold off hunger, and they are packed with sugar, which is a great short-term tool for keeping yourself awake when the exhaustion of working seven days a week with short sleep hours kicks in. Of course, it may get to be a bit much when everybody gets the same bright idea to bring in donuts. Hazuki’s spiel aside, I don’t think anyone there actually wants to end up as overweight as her cat. Thus, sharing the wealth is in order. 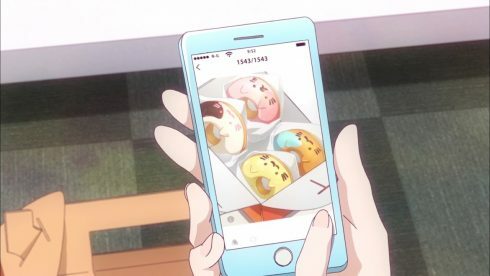 But first we get another glimpse of Aoba and Nene’s relationship as Aoba sends a picture of the donuts to tease Nene. 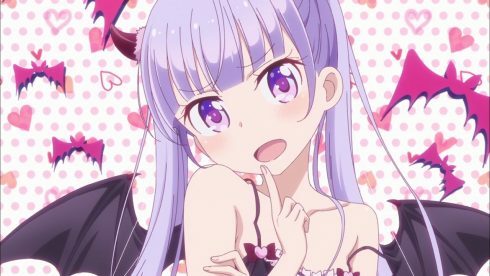 Hifumi worries about Aoba turning sadistic with people she gets close to, but this seems to be a pretty standard level of teasing between friends, to me. 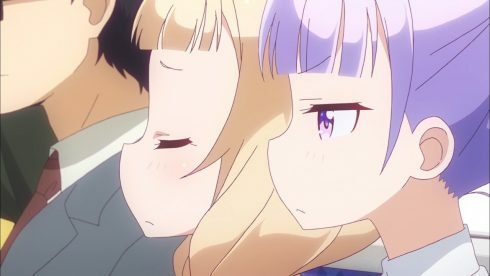 When people know each other as well as Aoba and Nene do, they learn to tolerate a certain degree of joking around, and learn what the other will and won’t put up with. Friends can accept more teasing from friends than from strangers, precisely because we know each other’s boundaries, and we know that our friend doesn’t actually mean us any harm by what they’re saying/doing. 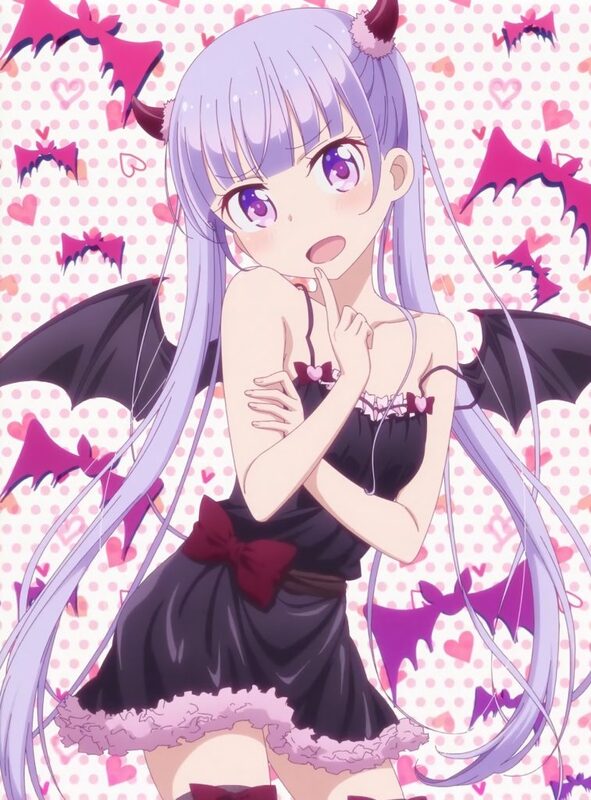 That said, Hifumi’s imaginary devil-Aoba is pretty adorable. 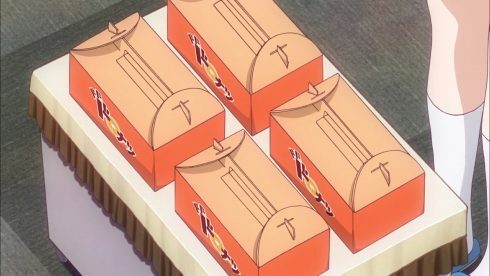 So, some donuts head off to the programming booth. 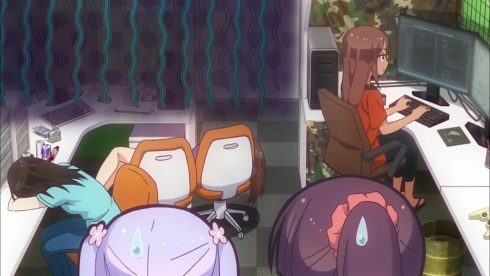 The programming booth of a video game company during crunch time. A horrifying battleground, where the body-count climbs higher every day. 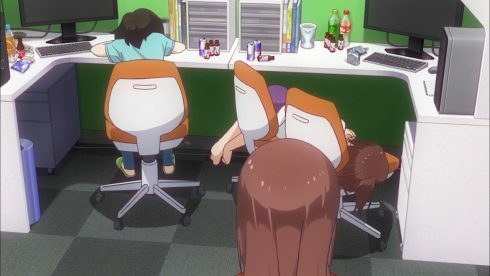 The programmers lie slumped over their desks or collapsed across chairs, with several empty cans and bottles of energy drinks lined up nearby. 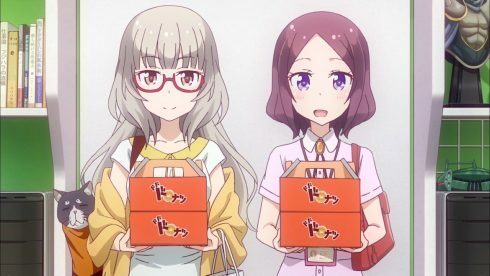 Only the battle-hardened Umiko remains functional to receive the gift of extra donuts, and give Hifumi a grenade shell as a thank you gift. 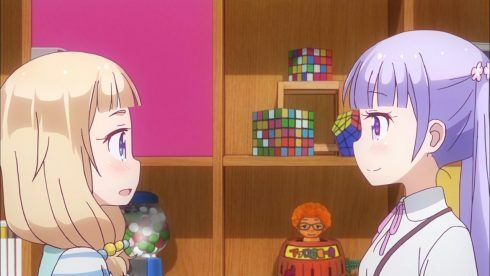 Fortunately, Aoba recognized the signs of Umiko about to go off on a discussion about her hobbies, and pulled Hifumi and herself out before it was too late. 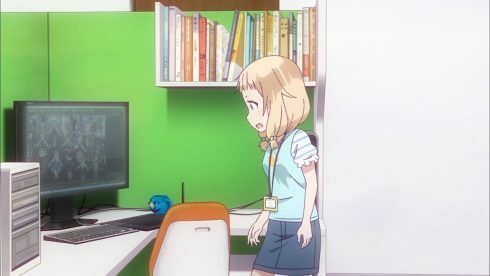 A number of programmers who watch the show have spoken up elsewhere to confirm that the view of the programming booth is completely recognizable to them. 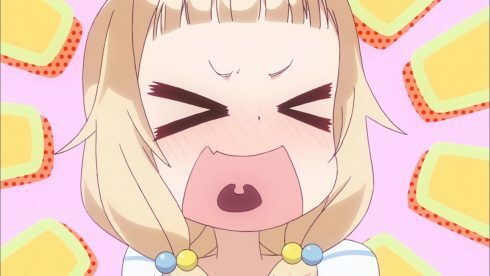 Everyone burning straight through on sugar and caffeine without stop trying to meet deadlines until they pretty much just collapse in their seats. 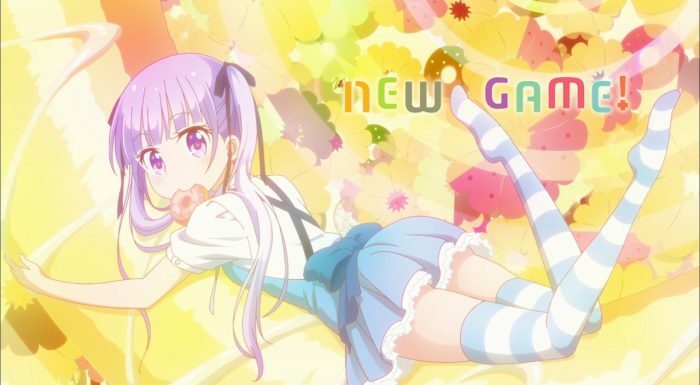 Anyway, on to the second half of the episode. 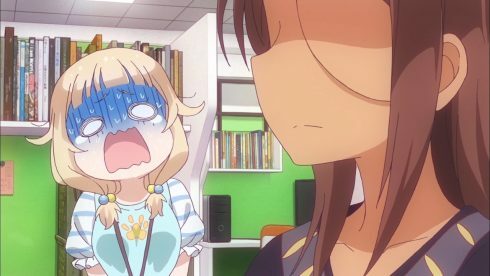 I have to agree with Nene in getting worried, all the more so because I’ve done the whole working with four hours of sleep thing myself. 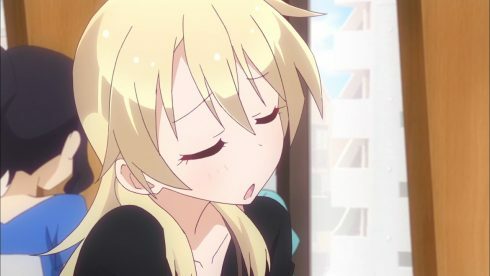 I, however, was not working weekends, so when I got home on Friday night I could just crash, sleep through most of the weekend, and feel at least vaguely ready to face the week again by the time Monday happened (note, I do not advise anyone to try this sleep schedule). 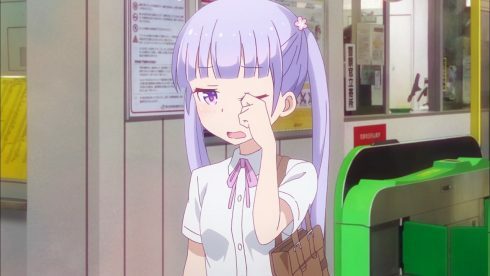 If Aoba’s only getting four hours of sleep per night and working weekends, she’s heading for a serious crash. Even just doing it over the weekdays like I did is super-unhealthy, and I felt awful by Friday. 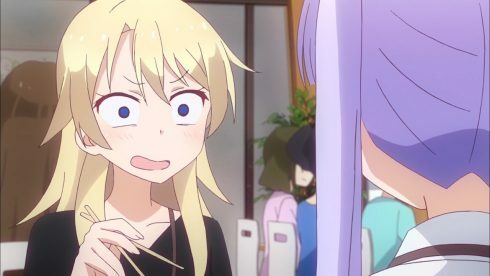 Nene is probably going a little overboard due to how much she worries, immediately laying blame on the company. 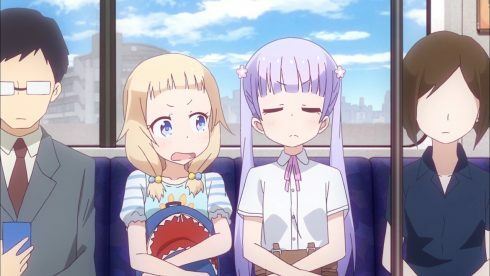 Aoba, already probably a little grumpy from how tired she is, takes that personally and attacks Nene where it hurts. 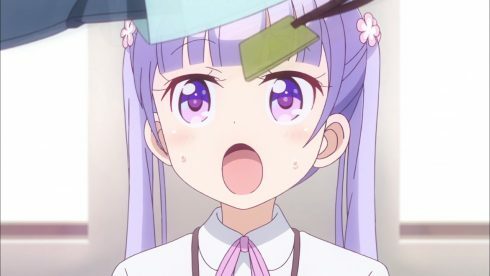 In the end I have to say that Aoba is more at fault here. 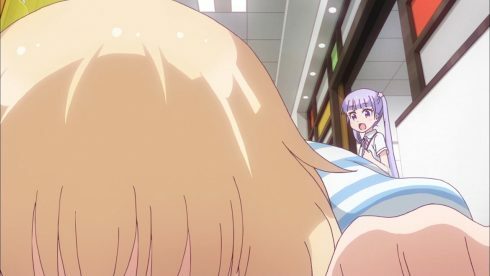 While Nene may have been a bit overboard, her comments were motivated purely from concern, while Aoba was just lashing out with purely personal attacks. Of course, it’s much easier to analyze something like this from the outside. When you’re in the middle of it you generally feel like you’re right and the other person was the one at fault. All things considered, as fights go, this one may seem pretty minor, but it does lead to them not talking for a good part of the day, and it’s clear that that’s weighing on them. 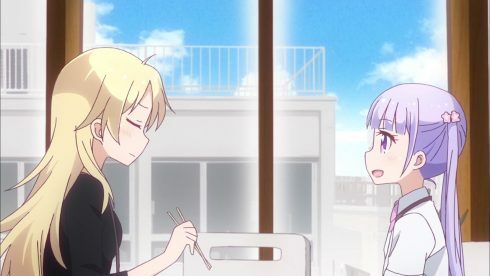 Nene vents to Umiko who gives her a good sounding-board for working out her feelings, while Aoba is left to contemplate everything alone for the first half of the day. 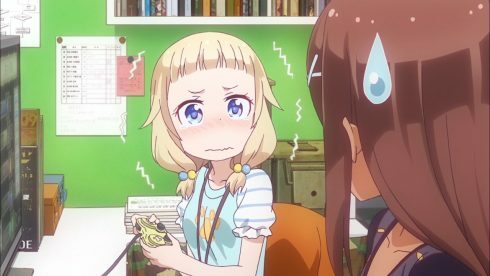 The fact that she’s been unable to concentrate on work at all indicates that she really does care, no matter what she tries to tell herself. 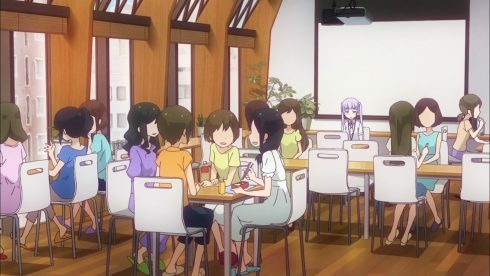 And the view of her all alone in the cafeteria, surrounded by faceless people from other groups all sitting with each other while she’s at her own table… the loneliness is palpable. 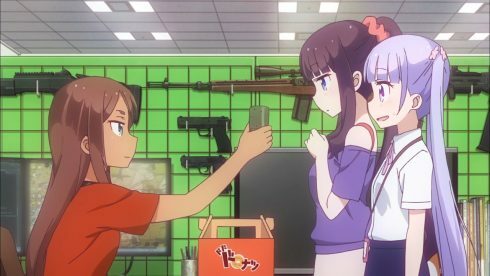 Fortunately Ko drops by (sorry Ko, but everyone knows you and Rin are practically married. 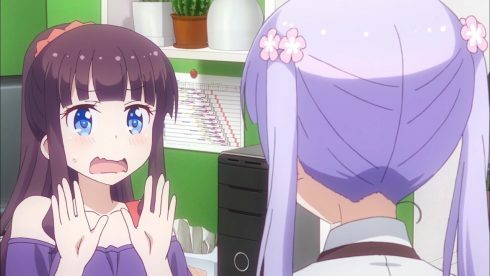 You’re not going to get a reaction for that!) 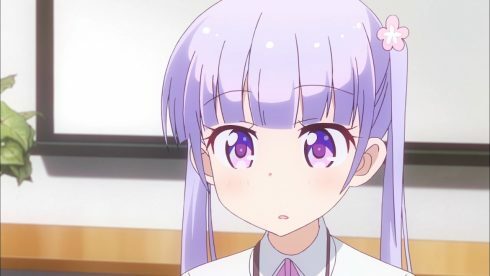 to give Aoba someone to talk over her feelings with. It’s actually rather interesting what that talk both does and doesn’t do. 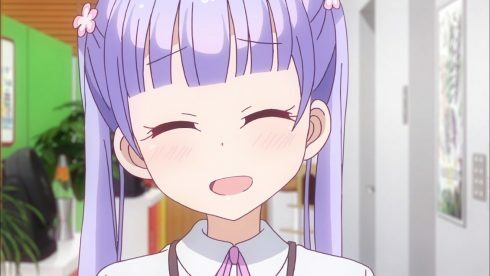 Ko validates Aoba’s feelings, saying she and her mother have discussions like that as well, with her mother worrying about her health and the hours she’s working, which is what a good mother should do, and Ko is glad she worries about her, but she just doesn’t understand. 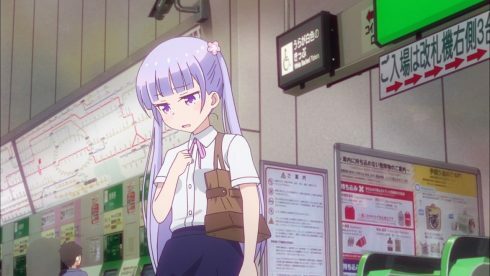 This is no senpai coming along with all the answers to resolve her troubled kohai’s problem. No great wisdom is being passed here. 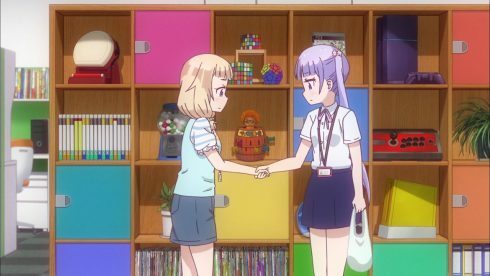 Yet simply by talking through it with a sympathetic ear, Aoba has calmed her feelings and soothed her heart to the point that she can finally recognize that Nene really was just trying to look out for her. 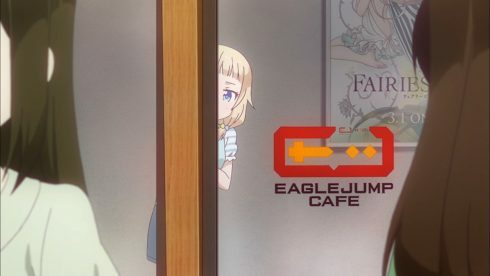 I am still amazed that the anime has managed to use the hyperactive bundle of mischief that is Nene to bring so much emotion to the series.Seeing her peeking in the window to the lunchroom, then creeping back to her desk to eat there, then looking at her screen when Umiko subtly urges her to go talk to Aoba and seeing the moment where Sophia-chan is sent to guide the heroes… there’s something there. 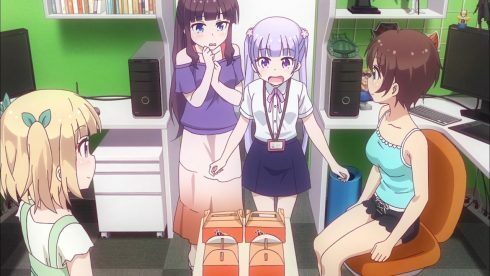 Seeing all of Aoba’s NPCs lined up together, realizing that Aoba is working hard so that she can get bigger and better tasks in the next release, all these things evoke feelings that I didn’t expect to feel here. Nene’s multi-perspective trip and short flight deserves a mention, at least. 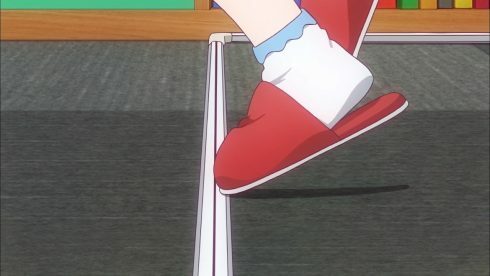 In the manga she tripped over a power cable that just happened to somehow be extended across the walkway at ankle-height, something I cannot believe any self-respecting software company would tolerate, so I’m glad they changed it to a properly enclosed cable-run. Of course, it’s harder to imagine tripping so spectacularly over something like that, but hey. 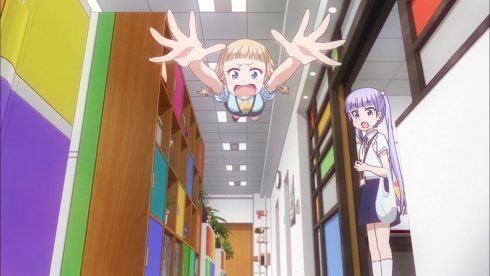 Who needs physics in anime? 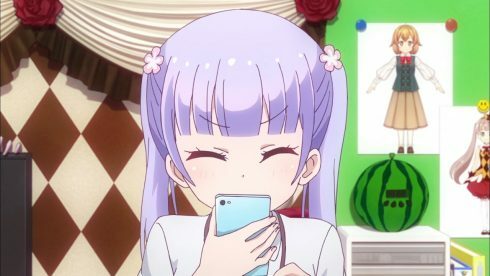 Anyway, seeing Aoba and Nene make up is heartwarming. Both of them admitted the parts of the conversation where they’d been wrong, and neither of them wanted their friendship to be damaged by something like this. 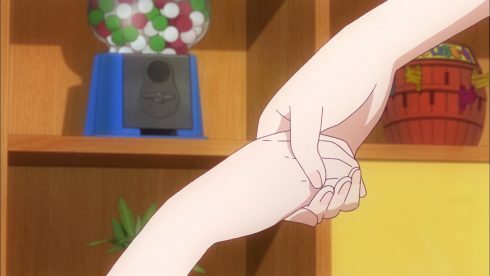 They’re too important to each other for that. 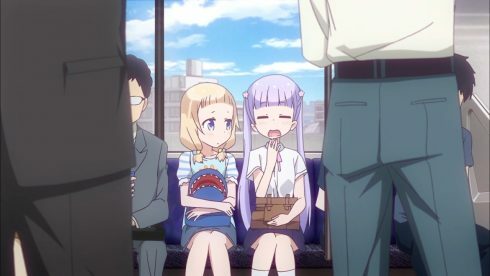 Oh, and you’d better keep that autograph hand ready, Aoba, because I don’t think Nene said that lightly. 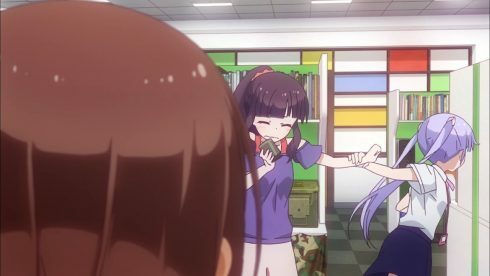 But of course, this wouldn’t be an episode with Nene in it if she didn’t screw up somehow, and this time she managed one of the big ones. Feet in cables = bad. 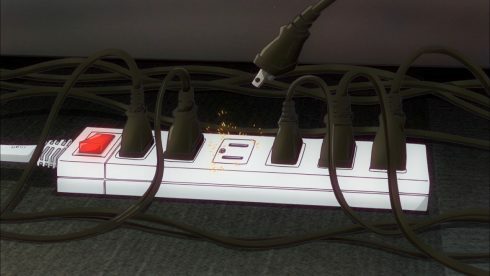 If you find your feet getting caught up in cables, stop, look under the desk, and see if there’s some way to move the cables, or re-position your feet so they won’t come into conflict. An accidentally unplugged power cable is bad bad news. Work can be lost, files can be corrupted, some pieces of hardware take a long time to get back up and working once they go down, etc. 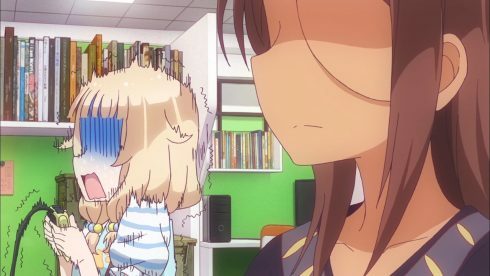 Umiko has good reason to be displeased. Nene may end up duct taped to the chair before this job is over. 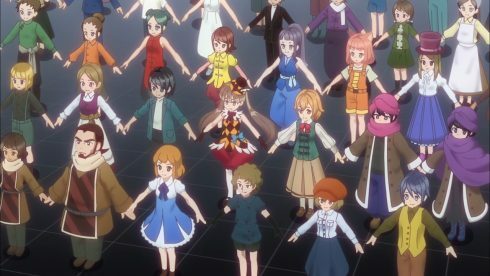 So, another good episode this week. I’m not sure what’s going to happen next week. 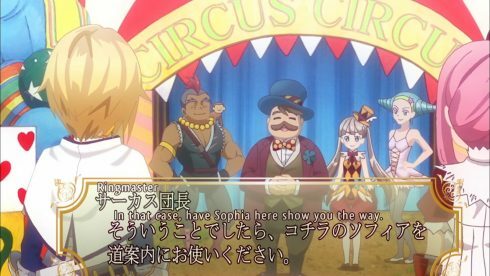 The line of dialogue that they used for the episode title is from a chapter that has had other parts of it already adapted into earlier episodes, so I don’t know what exactly is going to happen. But I bet it will be interesting. Come back next time and we’ll see. 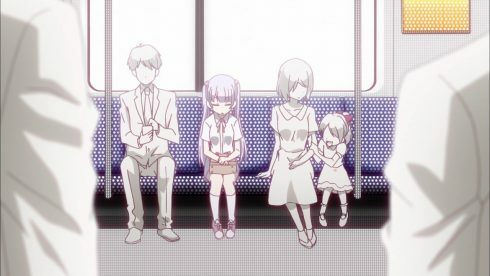 I don’t normally do anything bigger than a normal screnshot, but this is just too cute not to share. Thanks to a nice person on reddit for the full-length image.